TP Mechanical was hired by Messer Construction Co., as the mechanical subcontractor on the University of Cincinnati High Rise Mixed-Use project. On March 18, 2107 we installed a 4-pipe vertical riser shaft 48′ long and weighing 8400 lbs. “This type of innovation is the type of installation that will continue to set us apart from our competition” stated Nick Davis. He would also like to personally thank all of the departments for the extra effort put forth that helped make this dream a reality. 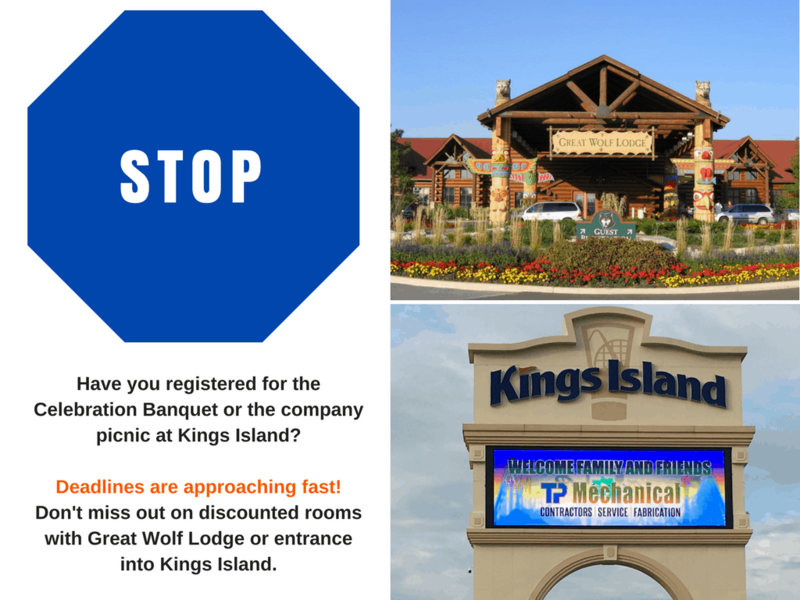 This is a friendly reminder that our deadline for room rates at Great Wolf Lodge end on April 25. Please note we have made changes to the way reservations are being handled this year. Please read all changes below prior to filling out the reservation form. Room reservations to be made by contacting Great Wolf Lodge; reservation deadline April 25, 2017 to receive the discounted rate of $178 per room. We cannot guarantee the hotel will have available rooms after April 25, 2017; nor can we guarantee the discount rate. To make reservations please call Great Wolf Lodge Central Reservation Department toll-free 1-866-954-9653 and use Group Reservation #1705TPME. A credit card number is needed to hold the room; no charge will be made to the credit card. Join us for the TP Mechanical Celebration Banquet on May 19. Our guest speaker is Jon Sanchez, he is a veteran of the United States Navy where he served as an officer in the U.S. Navy SEAL Teams. Annual company picnic at Kings Island will be May 20. Please make sure to get your reservations in as quickly as possible forms can be found on our Events page. This page is password protected please enter 1705TP_Pic! to enter the page. Please contact Tara Teepe 513-898-8908 or Holly Welch 513-842-8481. Reminder to all employees enrolled in the United Healthcare medical plan that the Health Screening Voucher is due by May 31, 2017. Please click here to download the voucher. Forms must be returned to the HR department by May 31, 2016 to be eligible for the premium incentive. The screenings must have taken place between November 1, 2015 and May 31, 2016 to qualify for the premium incentive. Rodale Wellness published a great article called ‘8 Ways You Can Manage Stress Right Now‘. The article offers great tips to help manage and eliminate as much stress in life.